OUR BORDER TOWN is a groundbreaking new multimedia play concerning the divisive border crisis that continues to unfold in our own backyard. This world premiere docudrama is crafted from interviews with members of the Tucson, Green Valley and Arivaca, Arizona communities. Using their real names, these people live and work in or have travelled through our border region. Among the many Tucsonans represented are the Rev. John Fife; artist & anthropologist Alvaro Enciso; Mexican-born American business owner Luz Demay; entrepreneur Rocio Calderon, and many more. By sharing their divergent points of view, spoken with their own words, OUR BORDER TOWN creates a collage of perspectives about the personal impact of this crisis, and poses the question: can we even begin to solve it? OUR BORDER TOWN is a compassionate and very human apolitical play that investigates the massive effect on a people and a community when divided by barriers, both real and figurative. 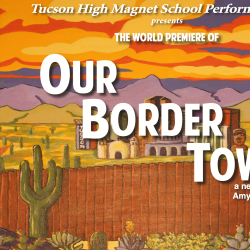 This WORLD PREMIERE play brought to life by the students of Tucson High Magnet School’s nationally recognized, multiple award-winning theatre program is an event not to be missed. OUR BORDER TOWN (c) 2019 is produced through special arrangement with Almquist Communications, all rights reserved.